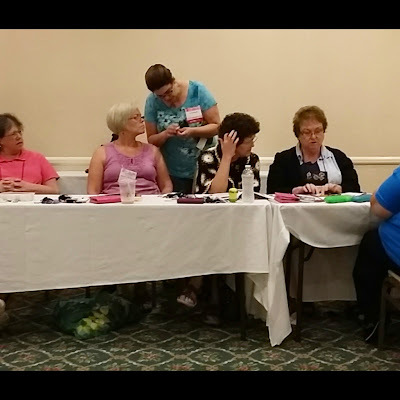 Stitch Story: Learning at the Knit and Crochet Show! 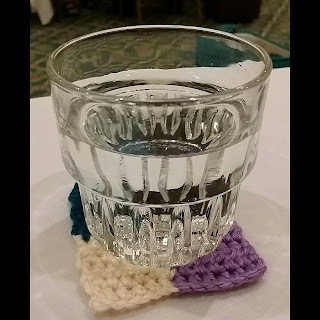 In my last post I told you about some of the fun I had at the Knit and Crochet Show in San Diego, and in this post I am going to tell you about the rest of the fun! One of the best parts of the conference is the opportunity to take classes from wonderful designers. It is amazing to be able to learn from others who have developed their own techniques. I find all too often, that I buy a lot of books about different techniques, but it is hard to find the time to actually sit down with the book to learn them. When you are in a class you have the time set aside, and the designer there to check your work. Such a valuable experience! 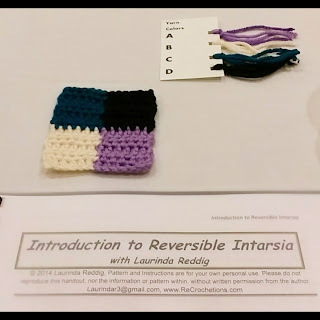 I took three classes while I was there: Reversible Intarsia Crochet & Edgeless and Reversible Cables with Laurinda Reddig, and Crochet Unspun with Karen Whooley. Reversible Intarsia was a full day class, and so interesting! We learned ways to change colors to help create different shapes. If you can graph it, it can be crocheted with Laurinda's technique. 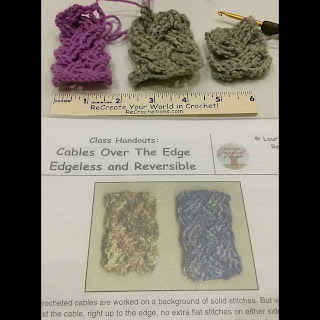 One thing I love about Laurinda's classes, is that she writes a pattern to follow to learn the techniques, which is something you can use. This is a great incentive to encourage you to finish your samples, even if you don't have time in class. Laurinda has written a book about the technique, which is a great way to learn about it if you aren't able to take a class from her in person. It also serves as a great reference for using the technique if you have taken her class. The Edgeless and Reversible Cables class was especially exciting, because I love the look of stand alone cables and cabled edging. Each sample was a little more complex and challenging. It is amazing to watch the gorgeous cable patterns emerge from a sea of twisted stitches, and such a bonus that her technique produces cables that are completely reversible! Laurinda is so ingenious, and it was fascinating to get a glimpse on how her brain works by taking her classes! 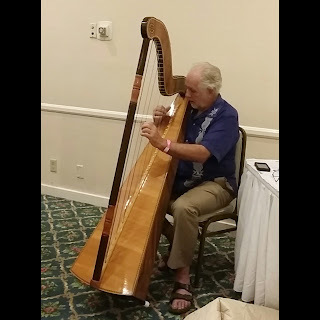 Her multi-talented father accompanied her on the trip to the conference, and in addition to being a knitter and a crocheter, is also a harpist! He treated us to a mini concert while we finished up our Reversible Intarsia Samples. Such a Treat! 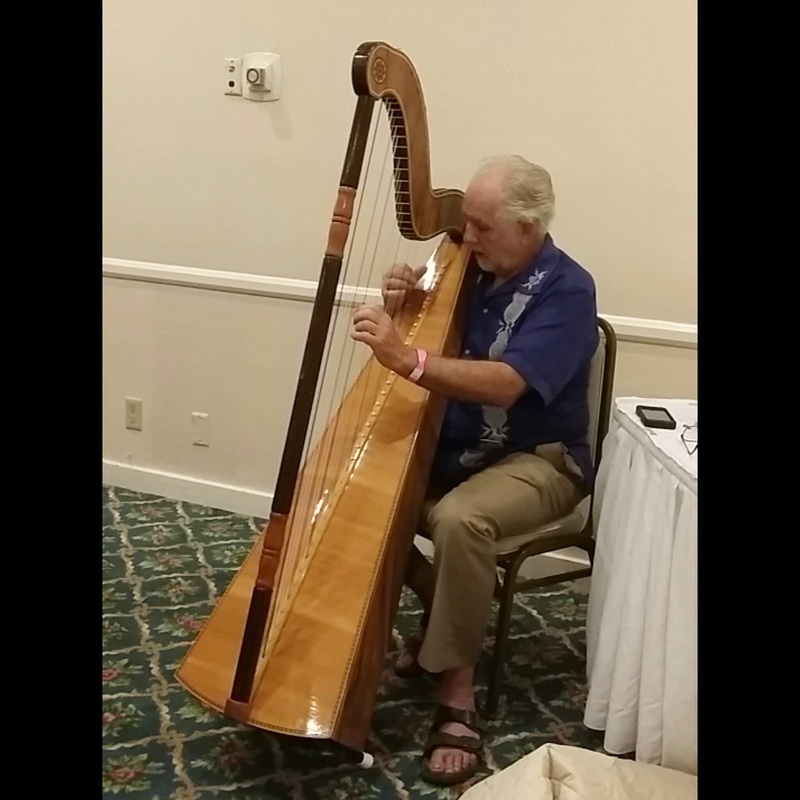 Laurinda's dad, playing for us! In the Crochet Unspun class, Karen showed us how to make our own yarn from a silk hankie, and how to take silk cocoons and make our own silk hankies. We also made yarn from wool roving without the use of a spinning wheel. It was fascinating to learn, and something I can teach my 9 year old daughter too! I have often attended fiber festivals and admired the beautiful silk hankies and roving, but I haven't gotten too into spinning yet, so I haven't had the excuse to buy anything- until now! I bought some extra cocoons from Karen so my daughter and I can have fun making and dyeing our own silk hankies! So fun! The 2016 Knit and Crochet Show will be in Charleston, South Carolina. Watch their website for more details!